There are some fantastic works of investigative fiction being written in Scandinavian countries these days. Anyone who is a fan of the Kurt Wallander series of books by Henning Mankell will know what I mean. Now we have a new addition to the shelf, courtesy of deceased author, Stieg Larsson. This is the first volume in the Millenium trilogy and after finishing this first installment, I am very much looking forward to the next two volumes. Larssson, a well respected journalist, died in 2004 soon after delivering the manuscripts for 3 crime novels to his publisher. While we have two more tales to look forward to, it's also a pity to realise that there won't be any more novels coming from the pen of this author. The tale is split between the shady secrets of a wealthy family and the murky dealings of a famous businessman. Mikael Blomkvist, a recently disgraced journalist, is hired by Henrik Vanger to investigate the disappearance of his niece almost 40 years ago. Vanger promises Blomkvist the means to clear his good name as part of the payment and Blomkvist accepts. 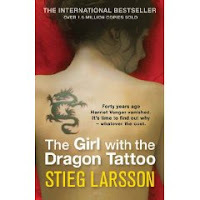 We also meet Lisbeth Salander, a disturbed young woman with a troubled past, but a brilliant investigative mind. This is an excellent taut thriller, and features several climatic events. The author manages to maintain an excellent pace throughout, but still delivers a strong social lesson while providing the thrills. It is an intelligent thriller with a conscience. I read all these books too, and then I give them to the little lad but he will only read about money and stuff like that. I was watching the lympics too, I was trying to get the hamster's to race for some hamsterlympics. But they were only eeking and then sleeping.